← A Great Time Had By All! A Funghi to be with! It’s mushroom season again! As many of you will know, Costanzo loves nothing better than getting up at the crack of dawn to go hunting for mushrooms. He has many secret locations that he visits, all of which involve a long drive, lots of walking through dense forests and being eaten alive by the dreaded Scottish midge. The midge is not the only problem he comes up against. Fighting your way through 6 foot ferns you run the risk of a lovely tick attaching itself to your body which you are not aware of until hours of blood sucking later when you find this strange thing glued to your skin which will not go away, personal experience from Costanzo and myself! Fields of sheep are not a problem but when they are mixed with cows and young bulls curious about what you are carrying in your basket then you have to be prepared to run, not an easy task in wellies! When you get to your final destination, the fun has only just begun! The mushrooms do not make it easy for you to just bend down and pick. 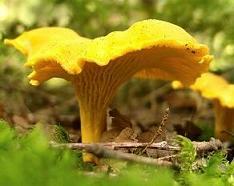 Often it involves a sheer 30 foot drop with the golden chanterelle tempting you to climb down to retrieve it. This is a two-man job with the bravest (or stupidest!) person who is prepared to risk a sheer drop into the river below volunteering to climb down. With one hand free to pick the chanterelle, the other hand is gripping onto a tree branch to prevent a tumble due to the fastly disintegrating earth moving below your feet, all the time being attacked by the midges. All of this is so worth it though when you see the earth covered in a carpet of goldenness as we did last week. At first we thought there were none. Then, we just seemed to turn a corner and were greeted by the most beautiful, fresh golden chanterelle we had seen in a long time. Hundreds and hundreds of them but all in precarious positions on the sheer drop. It took us hours but we got them all, two huge baskets full which seemed to weigh a ton carrying them back through the immense ferns, charging bulls and clouds of midges, back to the car, filthy but happy (us, not the mushrooms). All of this is done surrounded by spectacular scenery and on that day strangely for Scotland, bright blue skies and warm sunshine. Waking up the next day with sore bones and broken nails and seeing the baskets overflowing with funghi makes it all worthwhile. Next time you are in the restaurant and are lucky enough to have some of these which Costanzo prepares with Tagliatelle, Risotto or with some delicious Scotch Fillet Steak, you will know the effort that has gone in to tracking these down!